We’ve seen a lot of upholstered options for microenvironments in open workspaces, but Alain Gilles has taken a different approach that allows you to create a room within a room with the option of a view. Designed for the always forward-thinking BuzziSpace, BuzziBracks is a new architectural system where zones can be established within large, open offices to act as both a visual and sound shield to help with productivity. The standalone frames can be moved to any location and rearranged as needed offering optimal flexibility. 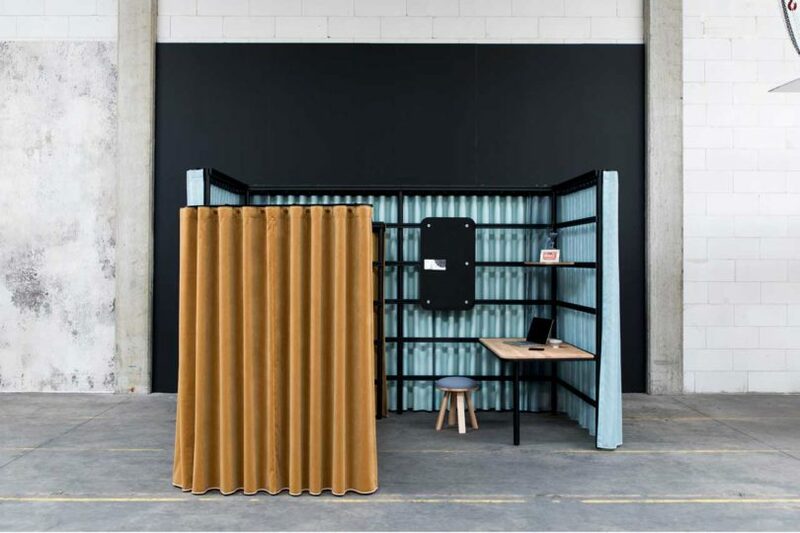 The frames are finished off with curtains that can be open or closed giving the user views of the surrounding workspace or more privacy if needed. In addition to creating separation, BuzziBracks’ curtains come in a variety of colors for added personalization. The choices range from transparent to opaque fabrics, even noise-reducing acoustic curtains in Kvadrat fabric. You can even mix and match the curtains to add more color. Inside the microenvironments, there are a selection of add-ons available to accessorize the space depending on its use, including worktops, flexible shelves, and hooks.